Mysterious Traveler combines the artist’s use of found steel objects discarded from an industrial culture, with fabricated steel forms. 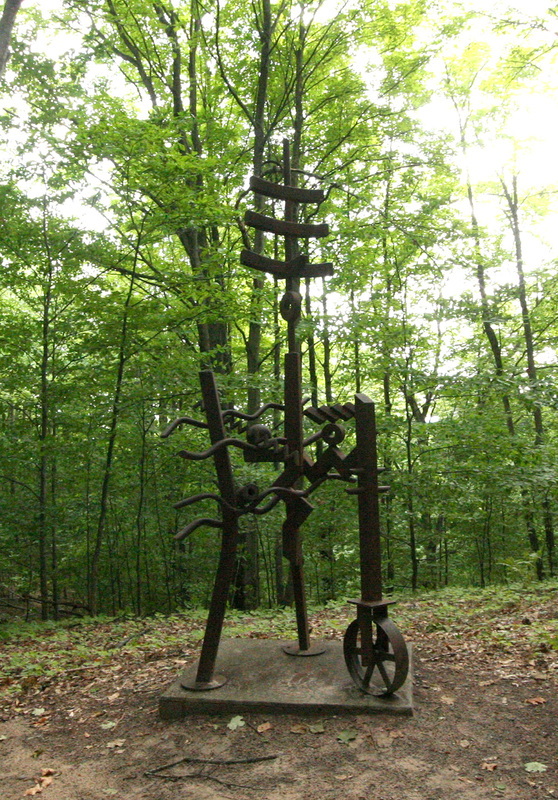 By placing it in a wooded setting, the sculpture becomes a mysterious traveler, foreign to this landscape but a part of industrial Michigan’s history. Growing up in Detroit, David Petrakovitz developed an interest in early industrial machines, seeing the beauty and grace of their forms and functions. “My recent work reflects my interest in these industrial forms in the creation of steel totems, masks and other welded sculptural constructions that often suggest a mechanical purpose and often appear to have some mysterious function.” Petrakovitz studied at Detroit’s Center for Creative Studies.